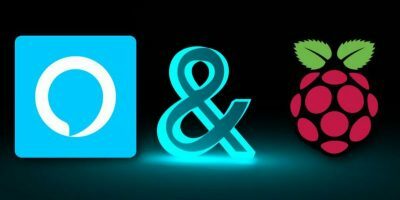 Now that you have your Raspberry Pi and you have followed our Beginner’s Guide, you may be wondering is it possible to make it go any faster. 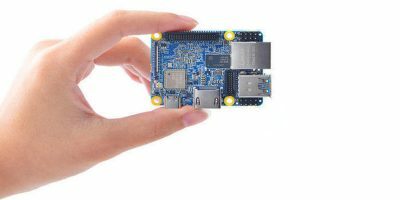 To keep costs low, the Raspberry Pi uses an older generation of ARM microprocessor (commonly known as ARMv6) where as most modern tablets and smartphones have moved to ARMv7, in fact some of Apple’s new products have moved to the 64-bit ARMv8 architecture. Also, the Raspberry Pi uses a single core processor while most other devices including desktops, smartphones and tablets have generally moved to dual or quad core configurations. This all means that at time, especially when using the desktop environment, the Pi can feel a little slow. By default, the processor in the Raspberry Pi runs at 700MHz but it can be overclocked. Microprocessors are designed in such a way that they perform one unit of work per clock cycle. One unit of work could be adding two numbers together or fetching something from memory. The faster the clock frequency, the higher the performance. 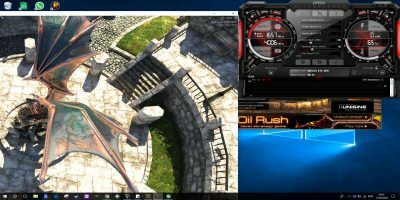 Overclocking means to increase the frequency at which the processor runs. 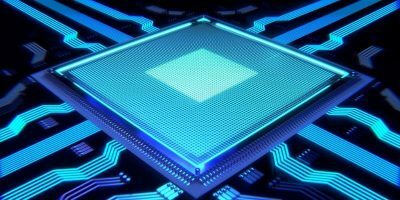 The problem is that each model of microprocessor is designed to run at its default frequency and overclocking takes the processor outside of its nominal design limits. If overclocked too much, the CPU becomes unstable which results in crashes or even SD card corruptions. However modern manufacturing processes mean that most chips, including the Broadcom BCM2835 used in the Pi, can safely run at higher speeds. Select “Overclock” and press ENTER. 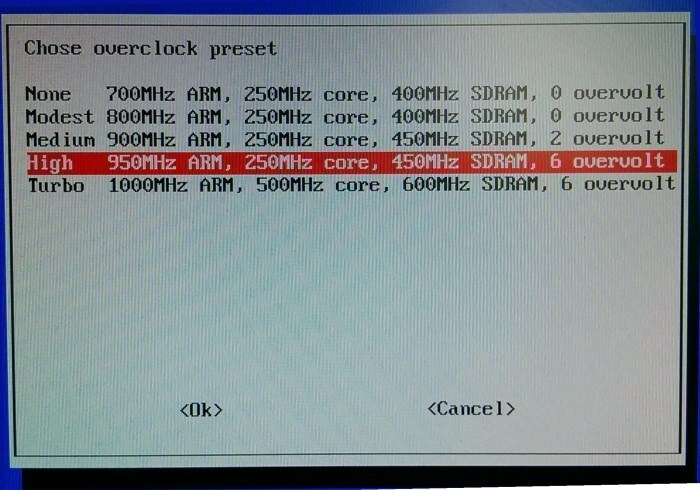 Press ENTER again to confirm that you understand the possible problems with overclocking. 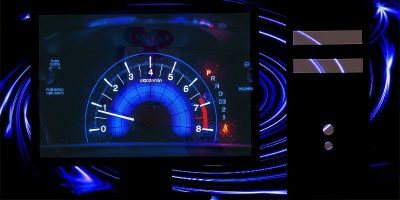 raspi-config offers five clock frequency presets: 700MHz (no overclocking), 800MHz (modest), 900MHz (medium), 950MHz (high) and 1000MHz (turbo). Use the up and down arrow keys to select the desired frequency and press ENTER. Press ENTER again when the confirmation dialog appears and then exit raspi-config. The result should be the frequency you selected in raspi-config. The highest frequency allowed via raspi-config is 1GHz but there have been some reports of SD card corruption at this speed. 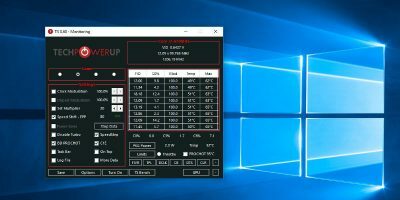 The actual stability of your overclocked Raspberry Pi depends on the your specific Pi and on the quality of your power supply. If you Pi ever fails to boot, because it is overclocked too high, hold down the shift key during boot up to disable the overclock temporarily and then use raspi-config to set a lower clock frequency. Try experimenting with the different clock levels. You don’t need to be over cautious as you can always select a lower clock speed if you feel your device has become unstable. However you should always backup any important data before experimenting. You type that command to display what is the currently configured maximum clock frequency. It should be the same as the frequency you selected in raspi-config. It is just a way to verify that the overclocking worked. Crappy instructions don’t say how to really overclock or what the rules for the clocks are! So go look elsewhere and find some better info. It is out there, freely available, and takes little effort. Probably about as much as it took you to be negative about the free instructions Gary Sims took his holiday time to write for you here. 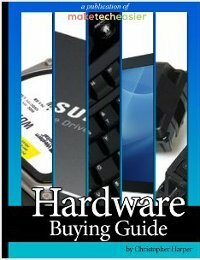 Better yet, write excellent overclocking instructions yourself! You are making many assumptions. 1. Dude did not suggest others instructions are not “out there”. 2. Dude did not mention any notion of free, cost, payment. 3. There was no negative. I know its hard to understand that but do try. 4. Holiday time? Let me make my assumption, stay off the cannabis. 5. You go write instructions. Not one of your sentences make any sense what so ever. Next time, simply do not reply and let others express themselves. Or did you think its okay for you but not for others? How is “Crappy instructions” not being negative? I am trying hard to understand this. it says I have 1000000 frequency. 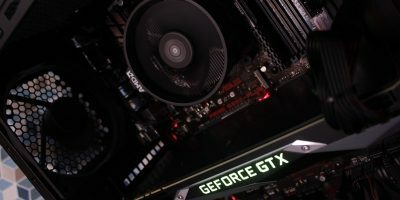 This is my first overclockng ever, so should i be worried? 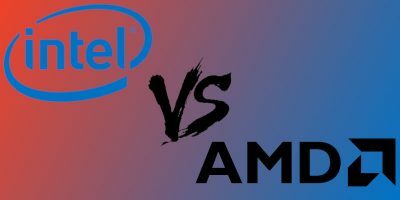 AMD vs. Intel CPUs: Which One’s for You in 2018?